PRODUCT DESCRIPTION: Trap which folds open like a clam. Once opened, it is set where beaver are active. 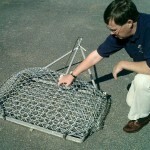 Generally, this will be best set out in open water with the trap hung from a tree or stake which is secure to the shore. 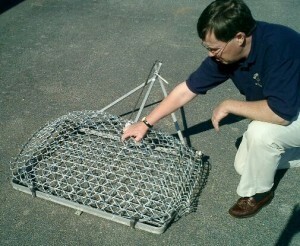 This will enable the trapper to both make the set and retrieve the trap from the shore. This trap would not be used on dams or mounds but it could be adjacent to these areas where beaver have been observed swimming. Use a bait like Poplar Oil on a stick for faster results. This design does use a strong spring so setting it can be hazardous. The big advantage to this design is that will trap beaver or otter alive and risk of injury is slim to none. It measures around 2 feet deep by 3 feet wide. WHERE TO USE IT: Along shore lines where beaver eat, have scent mounds or are logging or have been seen. RATE OF APPLICATION: You can use one at a time or employ more if you are trying to catch a lot animals quickly.